I play a lot of PlayStation VR games. While most games encourage players to stand stationary in the middle of an open space, I often struggle to do so. I am a klutz. In my reviews of PS VR games, you will often find words like “flail” and “fumble”. I have bruised my hands on the walls, tripped over cords, whacked my kids in the heads, and fallen over backwards in my chair. However, playing Transpose, the new PlayStation VR puzzle game by developer Secret Location, I managed a new feat of thrashing PlayStation VR failure. While attempting to solve one of Transpose’s fiendishly clever puzzles, I hit my head on the ceiling. Hard. I should quickly explain that normal players that do not share my “inspired” methods of puzzle solving are in no danger of incurring injury while playing Transpose. I’m just an idiot. So what’s all this now? Puzzles? With its stellar puzzle design, Transpose pushes players to think spatially and counter-chronologically. There is a solution to every puzzle, but suffice to say that the solution is most emphatically not “climb onto a chair in your living room and jump as high as you can.” Transpose is basically one long series of puzzle rooms, wrapped up in a graphical style that can best be described as “slightly fuzzy 1977 science-fiction novel cover art”. The eye-opening aesthetic that Transpose encompasses is striking. While there is no story to speak of, there is a basic through-line that has something to do with bringing the dormant heart of an ancient world back to life. Dead-world-resuscitation can be accomplished by entering room after room and figuring out what needs to be done to put a little box in a little box receptacle. As each room is completed, more energy is sent to the heart of the world, and…I don’t know. Stuff? Doesn’t matter. What matters though, is the way that players go about getting the little box into the little box receptacle, which is accomplished through an ever-more-complicating system of time travel and clones. Picture this: You stand on a platform at the edge of a gaping maw. To your right is a receptacle. It occurs to you that this would be the perfect place to put a box. You look around. On the other side of the gaming maw is another platform, and floating on the platform is a box. Perfect! Peering closer, you see a spawn point on the other platform. You point your finger at the distant teleporter, letting the powers-that-be know that you would like to be resurrected there, and then you throw yourself off the platform, committing videogame suicide. You respawn on the distant platform. You grab the box. Perfect! You turn to see the platform you were previously on, just in time to see your previous-self leap to their death. Sad! However, having seen this, you realize that time has started over when you were reborn. Your previous incarnation had been recorded and now will play back, performing the same actions that you already did while you are off somewhere else. Fun! The box receptacle is far too distant for you to make a three-pointer from your current position, and there is no way back to the first platform. In a moment of inspiration, you throw the box over to the first platform, not even aiming for the receptacle. You then indicate to the video game gods that you would like to respawn over on the initial platform, and once again leap to your doom. 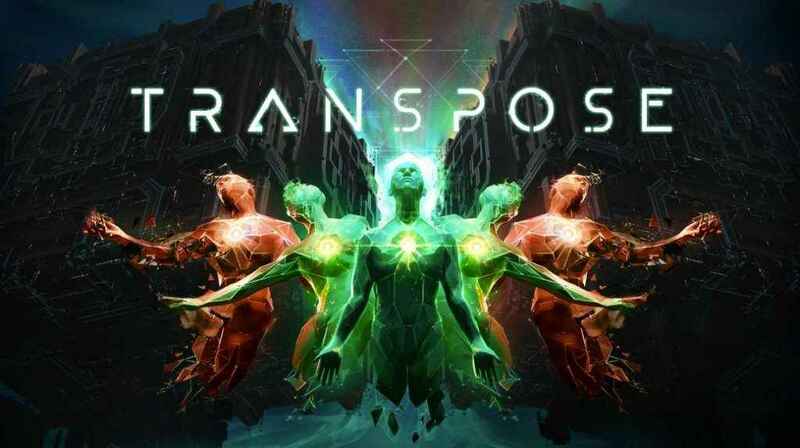 If you’re getting some Portal-esque riffs from Transpose, you’re not alone. You respawn on platform number one, with time started over yet again. Self #1 throws themselves off the cliff, while Self #2 grabs the box on the second platform and hurls it towards you. You put your arm out and neatly catch the box, just in time to watch Self #2 take the plunge. You put the box in the box receptacle, and you have won the level. Perfect! Transpose takes this basic idea of cloning yourself and restarting the clock and then iterates on it endlessly, squeezing out every drop of brain-bending puzzle juice that it can manage. Before long, there are levers to pull, buttons to push, and platforms to ride. Though players start with two or three clones, more are quickly added to the mix until you are managing a veritable army of past-selves. 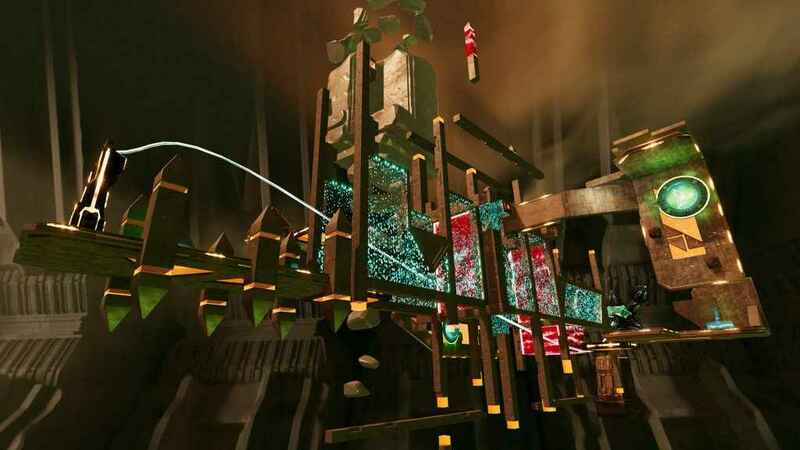 There are three hub worlds in Transpose, each of which contain around ten puzzles, which makes for a fairly lengthy experience. It took me around eight or nine hours to get through everything, but I do tend to stand and stare at things blankly for interminable amounts of time. Results may vary; the length of the game will hinge on how long it takes individuals to figure out the solutions to the puzzles. After a few rounds in the brief tutorial area, I realized that I had been throwing myself off of cliffs needlessly. It is possible to simply end a life by pressing a button (but it is somewhat less entertaining). As the game progresses more lives are added to your bank, represented by bracelets on your right arm. You can do what you need to do, then record your actions and start back at the beginning, trusting that your previous self will carry out your will. The clone system is extremely well implemented – especially in respect to the puzzles which are engineered around their use. It is possible, however, to simply spend some time looking around. The actions of each life need not be recorded. It is possible to dispose of your actions if you wander off track or mess up the timing on your intended run. I often found that it helped me to just burn a few lives wandering around and checking out the lay of the land before attempting to solve each puzzle. The final destination of the box is often hidden from sight initially, so it is good to spend some time monkeying around with the various mechanics as they are presented to see what’s what. The control scheme for Transpose is a bit unusual. More unusual is the fact that the game doesn’t much bother to tell you how things work, leaving it up to each player to fumble about until they have everything straight. The thumb button on the left Move Controller will propel you slowly forward in whatever direction you are looking, with incremental turns mapped to the triangle and square buttons. The thumb button on the right Move controller allows for very short hops, good for moving across short gaps or between passing platforms. This is all fine, except when you end up in possession of the precious box. In order to hold the box, you must maintain your finger on the trigger button of whichever hand you are using. Holding that trigger down for extended amounts of time can lead to some cramping and slippage when combined with the movement actions. This can lead to some frustrating box dropping incidents, which is no big deal, you can just start a life over again, but when you are at the end of a complicated maneuver, dropping the box can be disheartening. 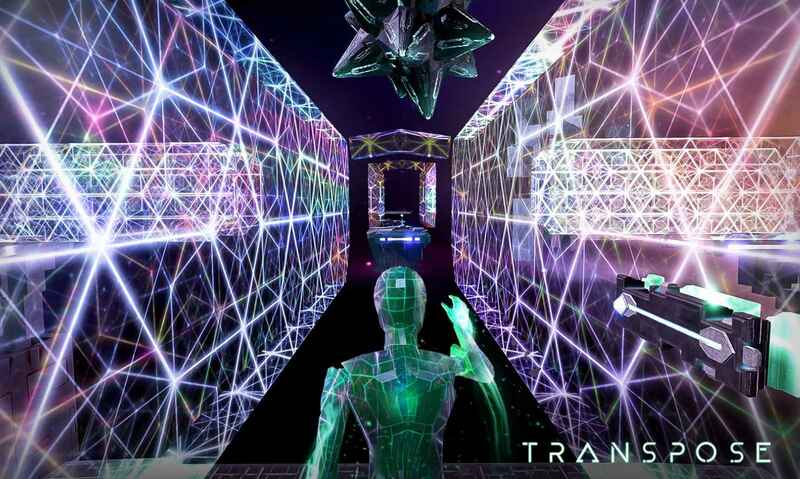 I do occasionally suffer from motion sickness when playing VR games, but I am happy to report that playing Transpose was pleasant from beginning to end. The motion is kept very smooth, and even if it weren’t, I spent most of the game time standing still and thinking. Transpose is a very safe game, even for the highly sensitive. 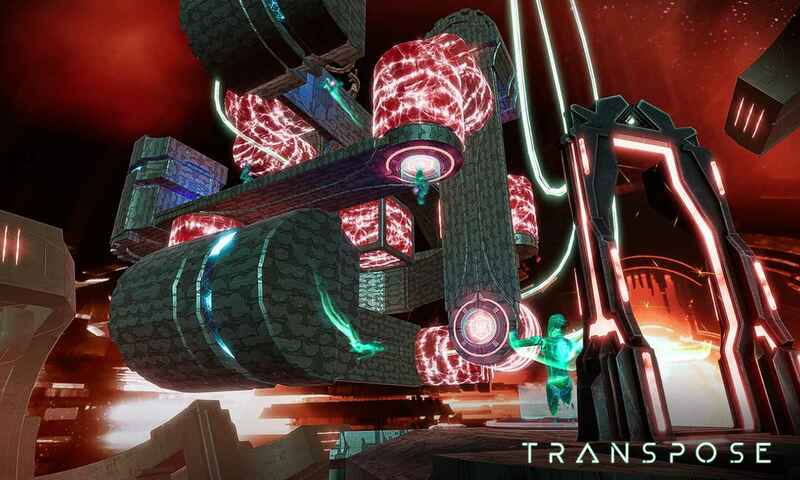 Transpose had the misfortune of releasing on the same day as what were arguably two of the highest-profile and most highly anticipated titles in PlayStation VR’s history. To make matters more complicated, PlayStation VR has been on an incredible run, releasing hit after hit, with several titles crossing over to gain mainstream attention over the past months. That said, many of the recent high-quality releases have been excellent twists on existing genres. Firewall: Zero Hour is a great VR FPS; Astro Bot: Rescue Mission shows the amazing ways that platformers can play with depth and scale; Tetris Effect is…super awesome Tetris. But Transpose is doing something that none of these other titles is doing – it is pushing VR’s capability to represent spatial relationships and tactile physics in unique ways that are not represented in traditional genre titles. 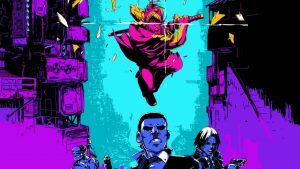 I wouldn’t go so far as to say that Transpose is creating a new genre, but I can say that I’ve certainly never played anything like it before. Thankfully, Transpose is an effort that won’t cause motion sickness among sufferers. Remember the way that your brain suddenly lit up when you played Portal for the first time, making you feel brilliant and dumb all at the same time? That’s how Transpose makes you feel (but with less taunting). 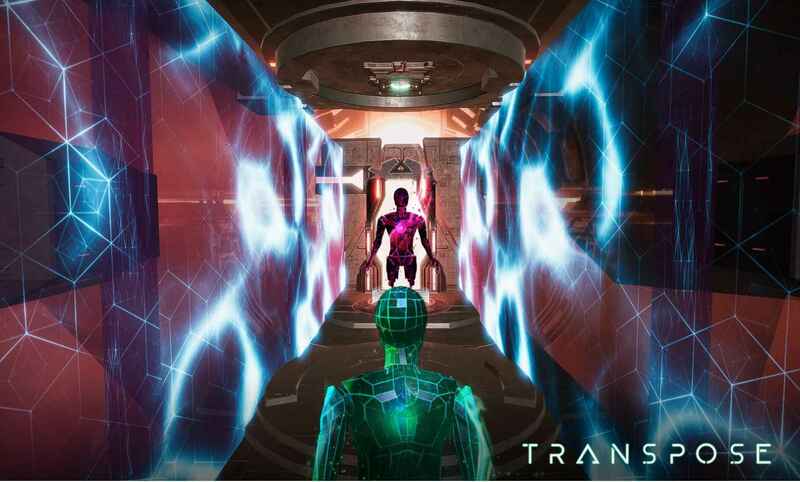 So while there are many shiny new games floating around the PlayStation VR store, if you consider yourself a fan of thinking games or puzzles, it would be a huge mistake to pass over Transpose. Transpose has that magic combination of frustration and satisfaction that most puzzle games are striving for, but few achieve. I have played other recent VR puzzle games that don’t even come close to the diabolically clever design at work in this game. When things heat up in the back half of the game and prior selves are floating in every direction, Transpose reaches a flurry of activity that borders on unbelievable. Transpose deserves to break through the noise of the crowded holiday marketplace. For a certain type of gamer, this title will be the catnip that they keep circling back to and pawing at while they should be thinking of other things. I actually thought of the solution to one puzzle while lying in bed one night, and I hopped out of bed to knock it out while the thought was still fresh. That’s how deeply this game embedded itself in my thoughts. There are a lot titles doing a lot of incredible things on PlayStation VR right now. But I strongly urge you to take a look at Transpose. It has an originality and style all of its own, and it is guaranteed to brush some of the cobwebs out of your mind. Just remember, no matter how difficult or complicated things may seem, the solution to Transpose’s many clever puzzles is never “climb on your chair”. Developed and published by Secret Location Inc.Transpose is out now on PSVR and PC. Transpose is an original and satisfying puzzler that is using a clever mechanic that is unique in the VR space. Visually arresting once it really gets cooking, Transpose should not be overlooked in the busy holiday gaming season. 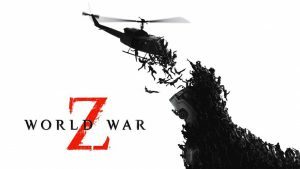 This one has sleeper hit written all over it.